There are those actors that make you laugh, and those who make you cry. There are brilliant one-movie-a-year actors that make people sit back and say ‘wow’, while at the same time taking home a certain prestigious golden statue each time they grace the silver screen. But there is this one phenomenon, who makes a person realize that acting, like any other job, just comes naturally to a few. Some guys are just born to act. And thus, we have Al Pacino. Among his best movies, one stands out for me as being his best performance ever – Scarface. 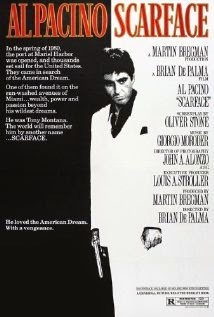 Scarface is about the rise and the fall of a certain Antonio “Tony” Montana, played by Al Pacino. Tony’s backstory is slight; he’s mentioned as being a political prisoner, but one gets the feeling that it probably was more than just that. Suspicious American Immigration officers interrogate him when he first arrives, and from this scene onwards, Tony’s boldness and brash honesty opens up paths for him. Tony’s friend, Manny has a contact, Omar, through whom they get a couple of jobs, and eventually get to meet the man in charge, Miami druglord, Frank Lopez. It is at this meeting that Tony falls for Lopez’s arm-candy, Elvira. From this point on, Tony’s rise really starts. His outright devil may care attitude wins over the druglord Lopez, and Tony starts becoming more prominent in Lopez’s schemes. A defining moment for Tony’s character is when he and Omar are sent to thrash out a deal with a powerful international druglord Sosa. Here, Omar is killed on being revealed to be a police informant, and Tony, being placed on the spot by Sosa completely captures the moment as his own. His dialogue, “I have two things in this world, my word and my b***s, and I don’t break them for nobody” is among the most remembered lines ever delivered, leading to Sosa eventually saying, “There’s no lying in you Tony”. There is of course, also a softer side to Tony, which is seen when he is around his sister, Gina. He probably thinks of her as everything he is not, the pure white to his dark black. He is shown to be extremely possessive of her. Tony is at his zenith when he gets married to Elvira, after killing off Lopez for trying to backstab him. At this point, Tony is a powerful drug kingpin who is high on his own product more often than not. This path of destruction culminates in him finding out that his close friend Manny had secretly married his sister, leading to Tony killing him. In the moments immediately after, Sosa sends his men to kill off Tony, which ultimately leads to one last hurrah for our hero, when a freakishly coke-high Tony busts a few grenades out his grenade launcher, after uttering the famous line, “Say hello to my little friend”. In a minute, he ends up falling face-first to his death, and almost fittingly, just as he destroyed everything around him, so was he destroyed. Tony is portrayed throughout as being a hard, focused, confident, outspoken, and determined man. He wants to make it, no matter what. And those qualities take him to the very top, albeit only for him to plummet right to the bottom at one go. The writer is a second year undergraduate Mechanical Engineering student.